Make me happy, make me feel fine. With a feeling that I’m gonna love you till the end of time. Don Ho’s lyrics perfectly capture the way we typically feel about asset bubbles. Asset bubbles are formed when assets become over-inflated and prices rise beyond any real sustainable value. As asset bubbles are developing and asset prices are increasing, we feel fine and warm all over, buoyed by hope the bubbles never end. Unfortunately, they are typically followed by a crash. They don’t last until the end of time. Many empirical examples exist going back to the 1600s when “tulip mania,” a speculative bubble in tulip bulbs in the Netherlands, resulted in a collapse. More recently, the Dot-com bubble of the late 1990s burst when shares of Internet-related companies soared to astronomically high prices. 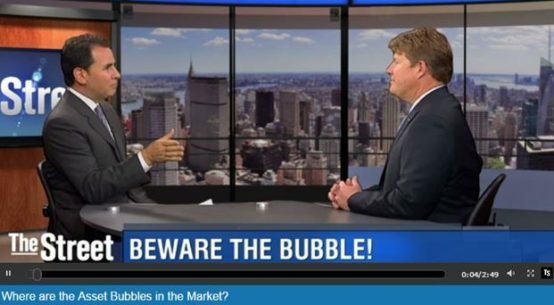 I also sat down with Gregg Greenberg at The Street to discuss asset bubbles. Identifying bubbles can be difficult. Bubbles have historically emerged in periods of productivity where structural change enhancements and/or a low interest rate environment were present. Examples include the railway boom, the electricity boom and the Internet boom. So the question of the day is: Are we experiencing an asset bubble? Clearly we are not experiencing a productivity boom similar to those that have promoted bubbles in the past. However, we are experiencing the other end of the equation—historically low interest rates. Quantitative easing (QE) has failed to promote economic activity as expected, but it has driven interest rates to virtually zero for six years. Given that backdrop, asset bubbles are to be expected. So are we in an asset bubble or is a bubble developing? I believe that a bubble is developing, caused by aggressive monetary policy around the globe. Presently the valuation of the market is rational, with the current price earnings (PE) ratio 20 times the last 12 months earnings and the current yield on the 10-year Treasury at 1.5 percent. Looking back, we now know there was a bubble in the equity market in early 2000. At that time the PE ratio was 30 times trailing earnings and the yield on the 10-year Treasury was 6.8 percent. Keep in mind that low interest rates and low inflation should support a higher multiple, so today 20 times trailing earnings would be defined as rational. Can we ride the bubble? When does the rational bubble become irrational? Again, history provides us some indication. For example, tulip mania manifested over four years and the “South Sea Bubble,” a British stock bubble centered on trading rights purchased by the South Sea Company in the year 1716, also lasted four years. Interestingly, Isaac Newton found himself caught up in this bubble and apparently lost money in the ensuing crash. His famous quote, “I can calculate the movement of stars, but not the madness of men,” sums up the irrational behavior in a bubble. Another famous example, Black Monday – or the stock market crash of 1987 – ended the bull market run that started in 1982. I always get a kick out of the November 1987 Time Magazine cover titled: “The Crash—After a wild week on Wall Street, the world is different.” I respectfully disagree. The world didn’t change because of a stock market debacle. Lastly, the Dot-com bubble I referenced earlier began in the late 1990s and developed over a five-year period. The bottom line is that history tells us most asset bubbles come and go within a three- to five-year period. Rational bubbles become irrational when valuations can’t be justified. I do not believe we are there yet. Are we in an asset bubble? Admittedly, the challenge in determining the duration of a bubble is defining the anchor points. When did the bubble actually begin and when did it end? Typically these anchor points are a bit fuzzy. Nevertheless, it appears that historically, bubbles have lasted three to five years. I know what you’re thinking: interest rates have been low for six years and the stock market has gone up since mid-2009. Does this mean we are in a bubble and will it burst? As I mentioned, it is extremely difficult to determine when exactly a bubble begins to develop. One key indicator to consider is that bubbles typically begin when we see an economic recovery turn into an expansion phase. After the Great Recession in 2008 to 2009, the Fed lowered interest rates to stabilize the economy and right the ship. However, GDP growth has looked tortoise-like from 2010 to 2013 rather than showing a more robust economic recovery that could then lead to the development of an asset bubble. I believe the rational bubble we are in today likely began around 2014 when GDP held steady at 2.4 percent, followed by 2.4 percent again in 2015. Stock market valuations have increased but are nowhere near levels we have seen them prior to past crashes. Interest rates are low and are expected to remain low for quite some time, yet inflation remains in check. It all appears to be rational. This signals investors to stay invested, buy quality companies and monitor the situation carefully. The previous examples I cited were situations where a bubble has become irrational and eventually burst, though not all asset bubbles end badly. We may experience the frequent development of asset bubbles over the years, but most remain rational and eventually dissipate as the markets correct. This may be precisely the situation we find ourselves in today. “UMB” – Reg. U.S. Pat. & Tm. Off. Copyright © 2016. UMB Financial Corporation. All Rights Reserved.